Maxi Pro 100 Billion™ is a probiotic in a delayed release capsule. Probiotics are live organisms (which need to be abundant) in your intestines to support assimilation of nutrients. 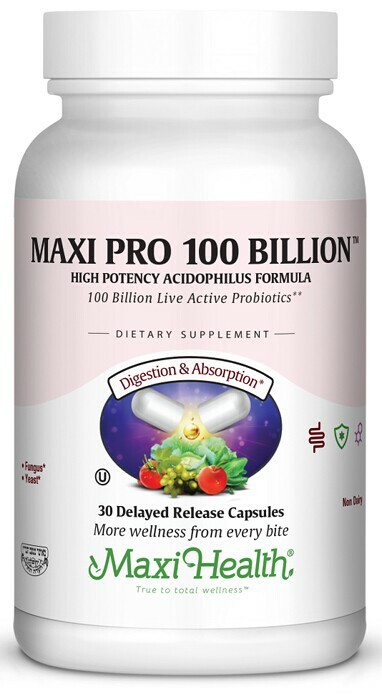 Maxi Pro 100 Billion™ has both important probiotics that you need! Lactobacilius acidophilus (providing 100 billion active organisms) and Bifidobacterium Bifidum (providing 500 million active organisms) which can replenish and even enhance the correct quality and quantity of healthy bacteria lost. See the table below for how it is lost and what it means to have it restored. When you or a family member needs a probiotic, make dairy free-delayed release Maxi Pro 100 Billion™ your choice. Take one (1) Maxicap™ before a meal or as directed. Other Ingredients: Hypromellose, microcrystalline cellulose, magnesium stearate, and silicon dioxide. This product contains no animal products, soy, wheat, yeast, salt, gluten, milk, artiﬁcial ﬂavors, colorings or preservatives.